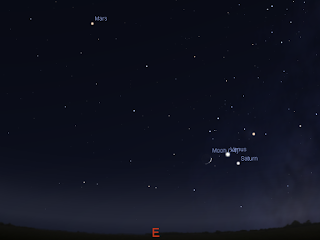 Early morning sky on Monday January 4 looking east as seen from Adelaide at 5:00 ACDST showing Mars, the crescent Moon, Venus and Saturn with the red star Antares close by. Venus and Saturn form a triangle with the red star Antares.Similar views will be seen elsewhere in Australia at the equivalent local time. (click to embiggen). Early morning sky on Thursday January 7 looking east as seen from Adelaide at 5:00 ACDST showing Mars, Venus, Saturn and the crescent Moon with the red star Antares close by. 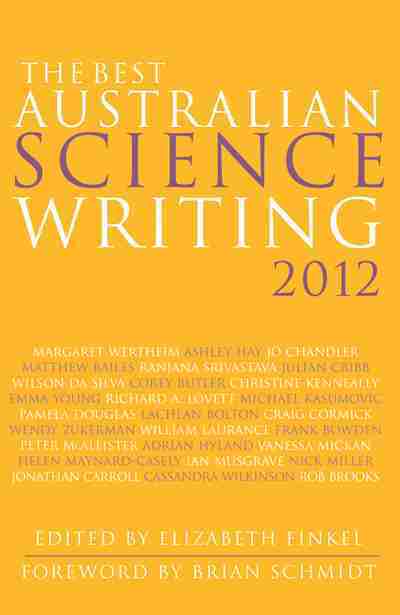 Similar views will be seen elsewhere in Australia at the equivalent local time. (click to embiggen). 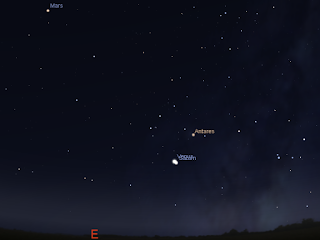 Early morning sky on Saturday January 9 looking east as seen from Adelaide at 5:00 ACDST showing Mars, Venus, Saturn. 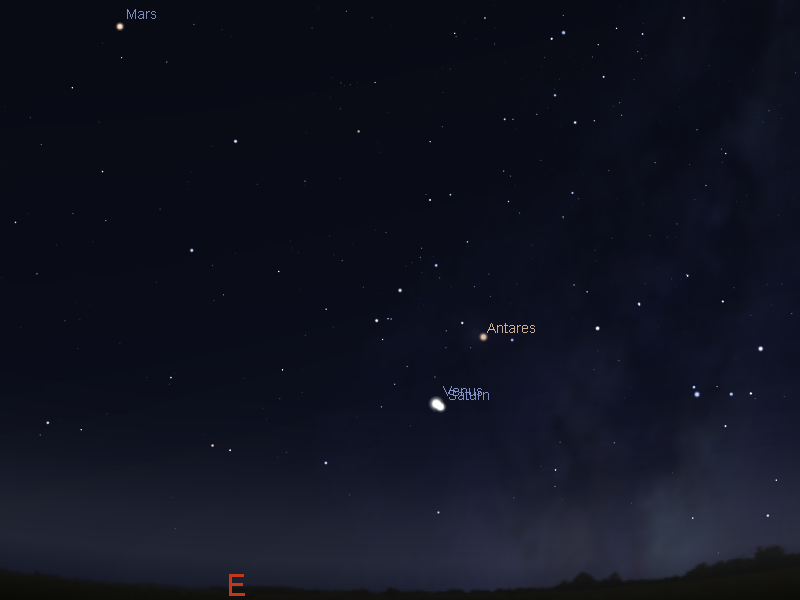 Venus and Saturn are at their closest and form a narrow triangle with the red star Antares. Similar views will be seen elsewhere in Australia at the equivalent local time. (click to embiggen). Simulation in Stellarium of the telescopic field of view in a 10 mm eyepiece. (click to embiggen). If you are up early in the morning over the next week the morning sky will delight you. 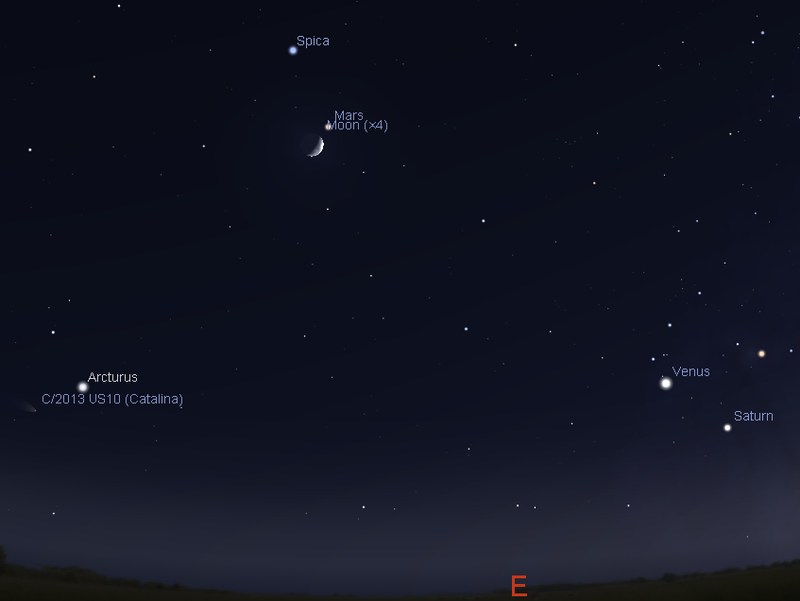 On Monday morning the cresecnt Moon is below Mars, and close to the horizon Venus and Saturn form a triangle with the bright red star Anatres. 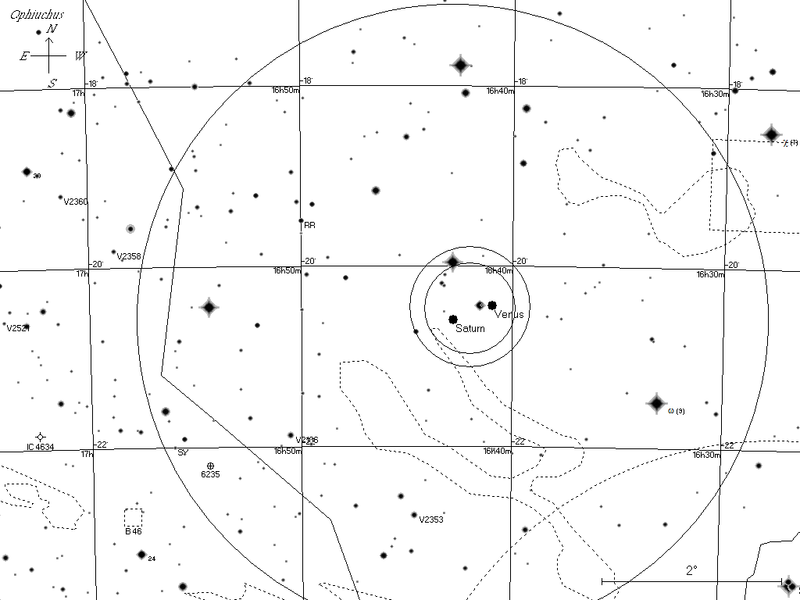 Venus is in the head of the constellation of the Scorpion, almost on top of the brightish star nu Scorpii. Over the week the crescent Moon heads for the pair of Venus and Saturn, and Venus comes closer to Saturn. 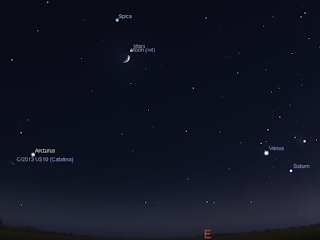 On Thursday the 7th The crescent Moon is close to Venus, Saturn and Antares. 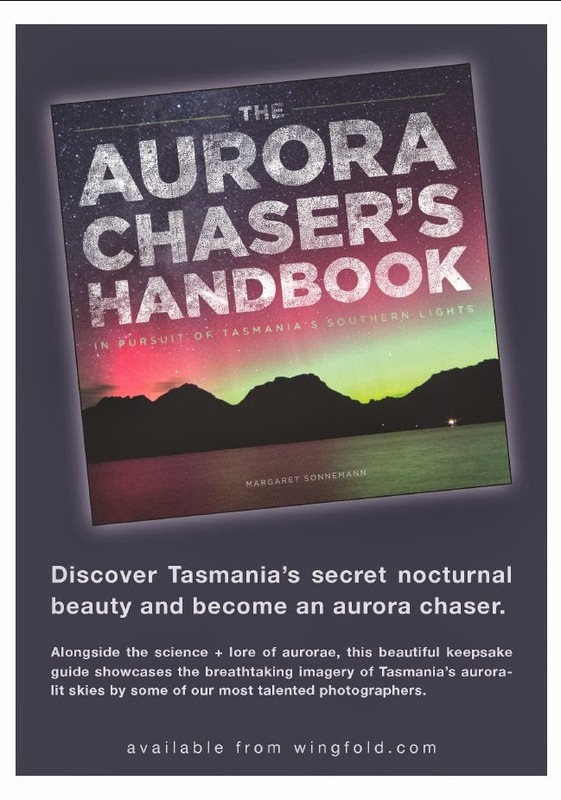 This will be a wonderful astrophotography target, as well as being beautiful to see. Binocular and telescopic view of Venus and Saturn on the morning of the 9th. 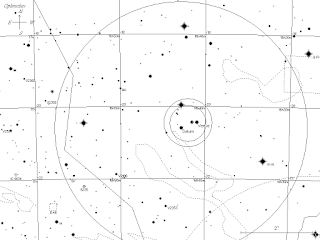 The large circel is the field of view of 10x50 biinoculars, the medium circle the FOV through a 24 mm eyepiece of a 114 mm Newtonian reflector, and the small a 18 mm eyepiece. 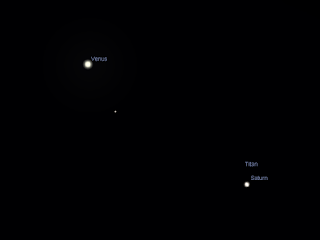 On Saturday the 9th Saturn and Venus are at their closest. If you have a telescope which can aim low to the horizon, you will see both Saturn and Venus together in wide field and medium power eyepieces. The pair form a very narrow triangle with Anatres, and again will look very nice in the morning. Unless you have a very level, unobstructed horizon, the best time to look is bit before an hour before sunrise.